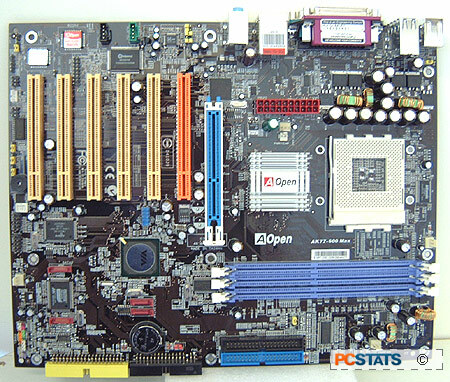 Abstract: As we've seen lately, AOpen packs a ton of value into their motherboards and their AK77-600 Max is no different. VIA's latest chipset is currently the KT600, a chipset that in all honesty is about one year too late. VIA should have released the KT600 last year in place of the KT400/KT400A chipsets. Had they done this it would probably have been enough for VIA to keep most of their AMD market share. Amazing as it seems, the year old nForce2 is still faster and more advanced then the KT600. All is not lost of couse. VIA realized that while they cannot compete with nVIDIA's nForce2 in terms of performance, when it comes to pricing it's a whole other ball game. VIA have, and can price the KT600 chipset far below that of the nForce2-SPP. When the bottom line counts VIA definitely remains in the game as most people think with their wallets, rather than sometimes obscure benchmarks. 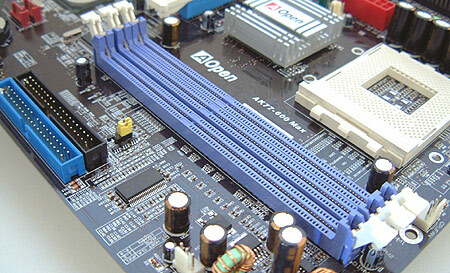 Today we're going to be testing the new AOpen AK77-600 Max KT600 based motherboard. As we've seen lately, AOpen packs a ton of value into their motherboards and their AK77-600 Max is no different. The AK77-600 Max supports four Serial ATA/Serial ATA RAID ports, an additional Ultra/133 IDE channel, IEEE 1394, Broadcom Gigabit LAN, 5.1 audio, IEEE 1394 and dual BIOS's. 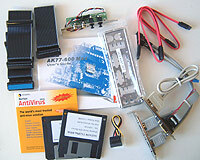 If you need more the 8x AGP port and six 32bit PCI slots should be more then enough! With so many computer cases with side windows, the appearance of internal components achieves more significance than it ever used to. And as they say, black is always in style. The AOpen AK77-600 Max is a full size ATX motherboard so it is best suited to full size mid-towers rather than those dinky little whiteboxes which have the CDROM 5.25" bays placed too closely to the edge of the motherboard. If you're computer currently uses the pricy nvidia GeForceFX's that are longer than a subway train at rush hour, you'll find that with the AK77-600 Max it has to be pulled out of the 8X AGP slot before you can install any memory modules. Of course, that's a small price to pay for a board with six PCI slots.